Hawkman, Animal Man, and Aquaman all cry out that "He comes for Superman". In the Daily Planet, Phantom Stranger arrives to find Clark Kent. He greets him and moments later the two vanish, leaving no one with any memory of their presence. Later, Clark sits at home and works on some work while Lois goes to bed. He joins her later and falls asleep as something stirs beside his bed. Superman dreams of a world where he rules over everyone with an iron fist, using corrupted heroes to enforce his power. Clark awakes and gets up to go for a flight. As he leaves Lois asks for pickles and ice cream. At the store, Superman suddenly lashes out and destroys a stand. Zatanna appears and expresses concern, but he tells her that he knows he's still dreaming. He blows Zatanna away and goes outside to find Lex Luthor attacking the city with a giant robot. Superman spits through the robot and right into Lex's head, killing him. Brainiac appears and Superman dispatches him as quickly. A legion of his enemies descend from the sky and Superman deals with all of them in similarly lethal fashion. After they have all fallen, Superman hears Jimmy's signal watch. Finding his pal, he tells him how annoying the watch is as he kills Jimmy. Perry is next to die and then he turns his heat vision on his apartment, with Lois inside. Flying to Washington, he steals the chair from the Lincoln Monument and moves it to space, where he lords over the planet from his new throne. The world sends missiles at him, but he destroys them easily. Moving to Smallville, he destroys the town and then moves into the Earth. Descending to hell, Superman encounters the Demon. He throws him out of his way. Ascending to the throne, he tells the creature there to get out of his chair. The beast asks him if he still thinks this is all a dream. The monster tells him how when Krypton was destroyed, Krypton's hell was also. But one small demon managed to grab hold of Superman's rocket and come to Earth. The lords of hell gave Rakkar power to corrupt Superman, and now he has done it. Rakkar changes Superman into a beast of hell. Suddenly a fist shatters out of the beast's chest and Superman emerges. Rakkar is confused, and Superman explains that the Phantom Stranger created a false soul for him to be corrupted while Superman remained safe. Superman tosses Rakkar to the lords of hell and returns home. Clark returns home and his entire memory of the ordeal is foggy. In hell, Rakkar still lives. Story - 4: I'm torn on this entire issue. Really, it's a largely pointless story, and I'm not really crazy about the idea of a Kryptonian hell. But on the other hand, this issue was just fun. It was fun seeing Superman turn evil without having a huge, Superman Rex storyline. It was fantastic seeing the army of villains attack Superman. I mean, they had Conduit there. Conduit! Sure this was just a silly gimmick because of the issue number, and we're in the middle of a storyline that needs to be finished, but I enjoyed this. Busiek really took advantage of this issue to do some great wacky stuff. Stealing Lincoln's chair and putting it into orbit? Genius! Sure this issue didn't further the overall storyline, but it was just fun, and we could definitely use more fun comics. Art - 5: Simonson is a fantastic artist, and it's great to see him on Superman. His style is a little rough, and for that reason I wouldn't want him on the book every issue, but there is such a fantastic energy to his work that I absolutely love. The splash of Superman killing the villains is beautiful. It took a little time to grow on me, but this is some great art. Cover Art - 3: As great as the art is, the cover really doesn't do it for me. 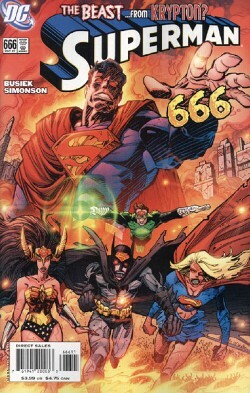 I like the demon JLA, but they were such a minor part of the story I don't really know why they were featured on the cover. Now if it was another fantastic villain fight I would have loved it, but as it is this cover just kind of falls flat.